From the very first day I heard about Dayjet and their air taxi model based on the Eclipse EA500 VLJ, I was rooting for them to write the playbook for how the fledgling air taxi industry would operate. 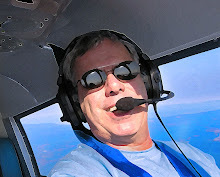 As travel by the commercial airlines falls deeper into an abyss of dissatisfied customers complaining about sub-par service, I have always felt an air taxi operation like Dayjet could ride into the business travel arena on a white horse and save the day. As they swept 1,000 of first-class passengers off their feet and into the air, their bank account would grow large. "The fate of per-seat, on-demand air-taxi firm DayJet is up in the air, and its aircraft are not. According to an FAA spokesman, the Boca Raton, Fla.-based company “parked” its entire Eclipse 500 fleet at noon today for economic reasons. AIN was unable to determine if today’s actions mean that DayJet has been shut down for good, or how many employees remain at the company. Eclipse Aviation also couldn’t be reached for comment on the status of DayJet’s remaining orders for approximately 1,400 Eclipse 500s." That last sentence might be the worst thing that could happen to Eclipse right now. Their company has been like a soap opera of late, and with Avweb's Russ Niles estimating the EA500 order book at 2,500 earlier this year, losing 1,400 of those orders will make a seriously huge dent in Eclipse's operating strategy. "DayJet, the pioneering air taxi operator that is Eclipse Aviation's largest customer has suspended operations and apparently vacated its Boca Raton headquarters. Although the company's Web site is still operational, calls to the main switchboard are being answered with voice mail. 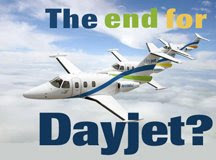 On Thursday, DayJet management were quoted in newspaper stories as saying the controversy over the certification of the Eclipse 500 would have no effect on operations and last week the company announced it was expanding service." These are some very dangerous economic times we live in right now. When entire financial sectors melt down like they have this week, it just seems that our money markets are far too tumultuous to expect that enough paying passengers will want to part with enough cash to fly by air taxi. The exact demographic that air taxi's affordability appeals to – middle and upper managers and Boomers with decent amounts of inherited "old money" – is the demo getting hit hardest in this downturn. These are Dayjet's bread-and-butter customers, and if the analysts are correct, we haven't seen the end of this disaster yet. Will Dayjet come back and someday dominate the air taxi game? I truly hope so. And will Eclipse be able to find 1,400 new customers with just north of a million to spend on a VLJ in this economy? That is a question that we will not be able to answer until 2009 because buyers of VLJs will be sitting on their money, watching in horror as their 401Ks disappear along with many of their high paying Wall Street and real estate jobs. As the Bush years draw to a close, all of general aviation hangs on by a thread, playing chicken to see who can survive the rest of 2008. I sure hope one company that makes it to fight on next year is Eclipse, because it would be a shame to see them throw in the towel after so many years of hard work. UPDATE @ 1218P ON 09.21.08: The Dayjet site has been replaced with the following, which pretty much closes this book: "DayJet Discontinues Passenger Operations - As of September 19, 2008, DayJet Services, LLC, has discontinued its jet services and canceled all future flights as a result of the company’s inability to arrange critical financing in the midst of the current global financial crisis. We regret the disruption and hardship caused by the sudden shutdown of DayJet services to our customers, employees, DayPort communities, suppliers and stockholders. 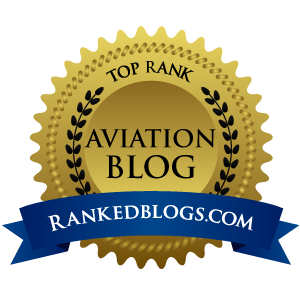 Unfortunately, DayJet is unable to honor customer reservations or issue refunds."